With an average growth rate of 35.7% over the year 2012, the e-commerce market in Eastern Europe is comparatively showing the strongest increase in Europe. The projected online turnover of €19.3 bn for 2013 indicates that there is a lot of ground to gain in the region: Only 27 of 106 million internet users are to date using the internet for shopping, reveals the latest report on B2C e-commerce in Eastern Europe released by Ecommerce Europe. Ecommerce Europe is the European umbrella organization for online retailers. Figures in Ecommerce Europe reports are based on the European Measurement Standard for Ecommerce (EMSEC). 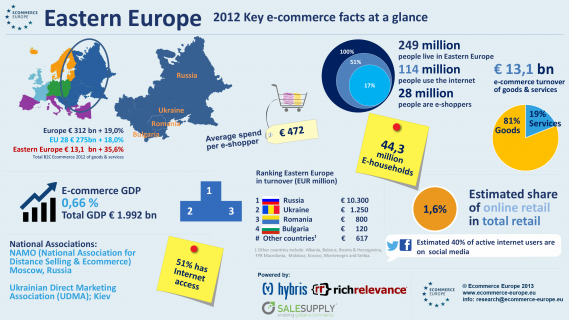 region‘s share in Europe’s total e-commerce turnover in 2012 is 7%. Often referred to as the “sleeping giant”, Russia already stands out with head and shoulders above the other countries of the region. The largest single market in Europe boasts the largest online population with 68 million internet users and 20 million online shoppers, generating a lion’s share of 78.5% of the regions total e-commerce market. Ukraine ranks second with total sales of €1.25 bn, followed by Romania with an online turnover of €0.8 bn. Russians spent on average €515,- on the internet in 2012, whereas Ukrainians spent €510,- and Romanians €400,-. With an average growth of 47% over 2012, the Ukrainian e-commerce market outperforms its regional neighbors Russia (35.5%) and Romania (33.3%). When it comes to internet penetration, Romania leads the way with a share of 54% of the population, followed by Bulgaria with 51%. Russia and Ukraine are on par with 50%. Within the next few weeks, Ecommerce Europe will publish one other Regional Report next to the Eastern European B2C Ecommerce Report, regarding Central, with an outlook on 2013 projections. The reports are powered by RichRelevance, Hybris and Salesupply. An abstract of the Eastern Europe B2C Ecommerce report can be downloaded online via: http://www.ecommerce-europe.eu/facts-figures/free-eastern-light-version-report.